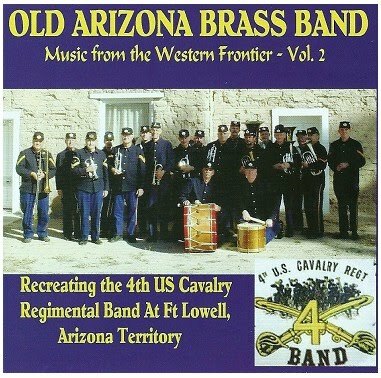 For those of you who enjoyed the 4th Cavalry Band at the reunion this year, they have released a new CD that is available for purchase. The new Album is titled “Music from the Western Frontier, Vol. 2. The issue date is August 2010. This album is dedicated to the memory of the Band’s Founder, Ray Hicks (1937-2006) who is the person most responsible for the success of the Old Arizona Brass Band. Some of the songs on this album feature his outstanding cornet solos. All of the music in this album was written in the 19th Century and typical of the music performed by Army Bands in the West in the late 1800’s. Much of the music on this album was regularly performed by Civil War Bands, as well. Included are a number of Marches, Waltzes, Polkas, Quicksteps, a Mazurka, a Quadrille and an Operatic melody. You’ll enjoy hearing the “Royal Decree”, a polonaise typical of the Grand March starting a Military Ball of the Period. Composers of the music on this album include Achille La Guardia, Patrick Gilmore, Claudio Grafulla, and Thomas Preston Brooke. The Old Arizona Brass band is a 501 (c )(3) Non-profit organization. The band's website is: http://oabb.homestead.com. If you enjoyed the band's performances at our reunion and purchased the first CD, this will be a great companion CD. If you enjoy military music this music is performed in the authentic musical style of a frontier Army band and is a great CD to have.